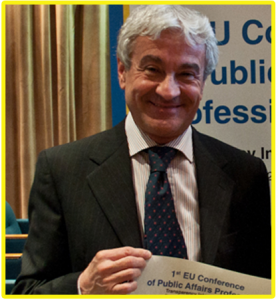 Giuseppe Mazzei (Rotondella, 1953) is a journalist, essayist and Italian Professor. He is Director of Institutional Relations of the Allianz Group since 2004. He studied theology at the Pontifical Gregorian University and graduated in Philosophy at the ‘University of Rome La Sapienza. Student of Karl Popper, he specialized in Humanities and Social Sciences. President of “Il Chiostro – per la trasparenza delle lobby”. Il Chiostro is an association that wants to promote the culture, practice and regulation in representing the interests of transparency. 4. contribute to an appropriate interdisciplinary training based on sound ethical values ​​of lobbyists.